The extraordinary discoveries from the submerged mesolithic archaeology at Bouldnor Cliff have re-written prehistory and put this Island site on the international archaeological map. In order to continue the work, the Maritime Archaeology Trust are now seeking funding from the general public. When a lobster was seen kicking some Stone Age flints out of its burrow, it started an underwater archaeological investigation that changed the way we see the earliest neolithic development. The transition from hunter-gatherers to farming settlements is one of the great watersheds in human development. The point in time when this transition took place on the British mainland has generally been estimated as around 6,000 years ago. The discoveries arising out of Bouldnor archaeology has set this transition back by another 2,000 years. The site is 500 metres out from Bouldnor cliff, eleven metres below the surface, at a level where radiocarbon dates obtained from samples of wood and plant macrofossils dated the habitation level at 8,000 years ago, around the time rising sea levels were beginning to isolate the Island. Archaeological artefacts from the site include worked and burnt flint, corded fiber, worked wood, and burnt hazelnut shells. Many of these artefacts represent early instances of such technologies and suggest that the mesolithic peoples of Bouldnor Cliff were connected to more advanced groups from Europe, relative to those on mainland Britain. Evidence of wheat found in the sediment points to a farming culture as early as any so far found on the Continent. The site material is remarkably well preserved compared with most archaeology of this period. The corded fiber represents the earliest string found anywhere in Europe. Some of the worked wood points to a log boat that is also one of the earliest known examples. Other worked timber includes a substantial post and parts of a structure, possibly bound together by the string. 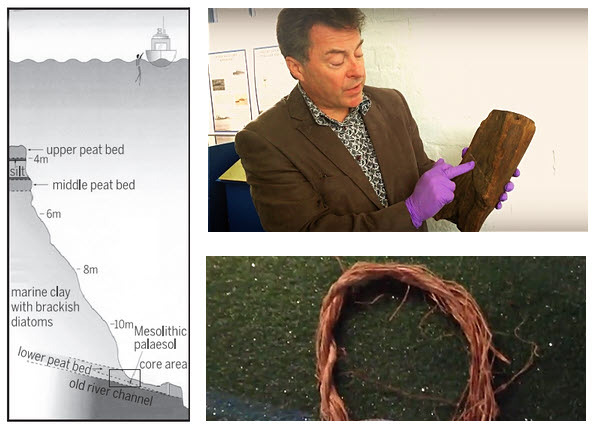 The problem now facing archaeologists is that the Solent tides are eroding the cliff and exposing more of the material, threatening its condition before it can be recorded and preserved. The site is under the direction of the Maritime Archaeology Trust and has now attracted international volunteers. Work on the site started in 2000 and until now has largely been funded by heritage organisations and local businesses. The trust is now seeking donations from the general public to continue the work. Details on how to make a contribution can be found here, together with links to the most recent Bouldnor archaeology. Diagram at left shows the position of the site and the challenge it poses to archaeologists. Top: site director Garry Momber pointing to a tool mark on a recovered section of post. Bottom: 8,000 year old string. Prehistoric enclosures are a common archaeological feature. Wide ranging in purpose, they can represent defence, ritual, settlement or some general communal activity. Their use can often be clearly identified, or at least invite informed speculation. 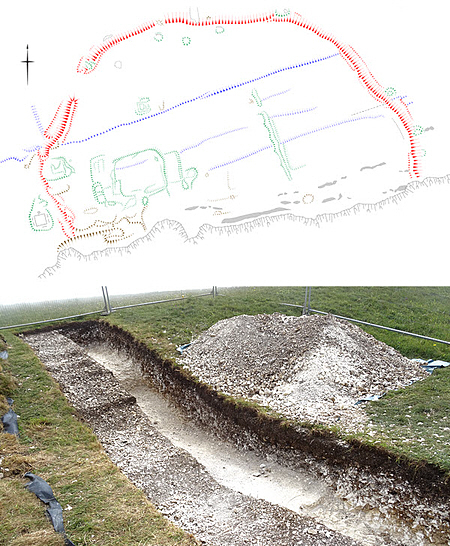 Last month's excavations on Tennyson Down are of an enclosure that is difficult to explain. National Trust instigated the excavation with an aim to identify the nature of the enclosure. MOLA (Museum of London Archaeology) were the contractors for this excavation and worked on behalf of the National Trust. Community engagement in the project was coordinated by CITiZAN, a volunteer led project which aims in getting people who live and work along the coast to get involved in identifying, recording and monitoring the archaeology of their coast. The feature is located on the east side of the Tennyson Monument and was more completely exposed when some woodland was cleared in 2014. It is about 230 metres across at its widest point. The most immediate problem in assessing the enclosure arises from its present state, where it is cut short by the cliff edge. If it was originally completely contained, nearly half of it has been lost to cliff fall. But there is no way of knowing for sure that was the case. It may have originally been part bordered by the cliff, although significant cliff erosion has certainly taken place since prehistoric times. The excavations involved three trenches cut across the enclosure at various points. They revealed a very low profile ditch and inner bank. The shallow ditch is cut into chalk with the removed material apparently forming the bank. There were no finds other than a tiny piece of copper/bronze, the significance of which will depend at what level it was found in the ditch. A geophysics survey failed to point to any associated features within the enclosure, although one section was excavated. An indication of other features have previously been noted on the site but they are assessed as being associated with later field systems and even some World War II activity. It has been suggested land erosion or some later activity might have reduced the profile of the enclosure but it seems unlikely as the existing bank/ditch ratio doesn't appear out of place. The low profile of the ditch and bank certainly rules out a defensive use and is unsuited to something like a cattle enclosure. Archaeologists have ruled out a causeway enclosure. It could just represent a communal meeting place but the journey up to the site and its exposed position might not encourage attendance. A ritual use would normally be evident by some feature inside the enclosure. Perhaps some prehistoric monument has long since been removed, or went down with the cliff. It would certainly be an ideal location for a visual impact, for much the same reason the Tennyson Monument is located there. The plan depicts the enclosure in red. Other features are thought to be unrelated. The Tennyson Monument is identified at bottom left. The photo shows a trench cut across the shallow ditch, fully excavated. July saw the launch of the Marine Antiquities Scheme (MAS), designed to do for underwater finds what the Portable Antiquities Scheme (PAS) has so successfully done for discoveries on land. It should prove particularly interesting for Islanders, given the activity around our coastline. MAS is funded by The Crown Estate and managed by Wessex Archaeology, covering England and Wales. Underwater finds are regularly recovered by fishermen, divers, boat operators and people enjoying a range of coastal activities. The process is designed to provide a simple way for people to record their finds and add them to a national database. The database is available online and will provide a valuable addition to public understanding of the nation's underwater heritage. Most finds will probably be accidental discoveries but finds that are intentionally sought should also be recorded. Whether the discovery should be left in situ or collected will depend on the nature of the item. The MAS area extends inshore to the Mean Low Water Mark. Finds further inland fall to PAS. If in doubt about a beach find, consult the Island's PAS Finds Liaison Officer. Unlike the PAS process, MAS will not have a local expert to physically examine the finds. The system will rely on photographic evidence supplied by the finder, qualified by further correspondence where necessary. This will then be assessed by experts and archaeologists. It is thought physical examination of the item will rarely be required. It will be interesting to see how the scheme develops. It certainly needs much wider publicity than it has so far received. PAS has the advantage of a core of dedicated metal detectorists providing input. MAS will have to create an awareness in people over a wider range of activities, although the ease of the recording process should encourage participation. The early finds include these clay pipes. They are of the short or 'cutty' form. Two carry relief moulded decoration featuring Masonic emblems, while the third is in the form of a male head. Right: the MAS mobile phone app.